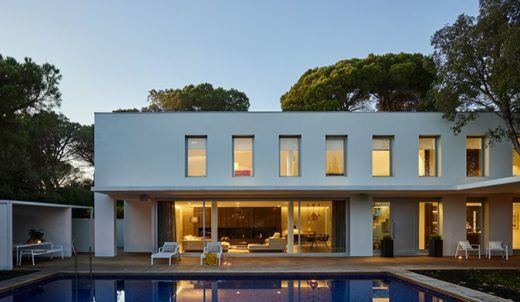 This house in the Vallvidrera neighborhood, a residential area with views overlooking the city of Barcelona, is located on a very sloping and small plot. The objectives was to get the maximum possible building area within a tight budget and an optimized orientation of all openings while protecting the privacy of the owners. 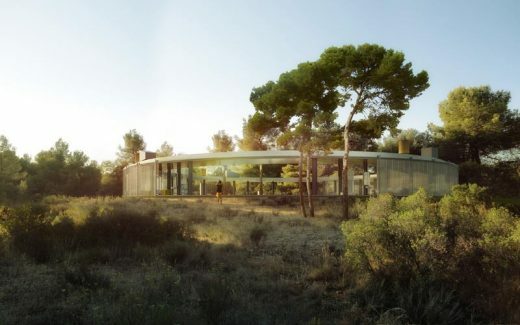 This respectful house is located in the chain of Collserola mountains, effectively the Nature Reserve of Barcelona. This building site is on a small south-facing hill. This residence needed a formal dialogue with an existing house, integration with surrounding green space and incorporation of passive and active systems to advance the building’s commitment to environmental sustainability. A late-19th century mansion now owned by Vilassar de Mar Council. The building is located on the Riera de Cabrils watercourse. A high wall of almost 6m at the back of the site forces the house to orient sideways towards the only side of the plot with no immediate obstructions. 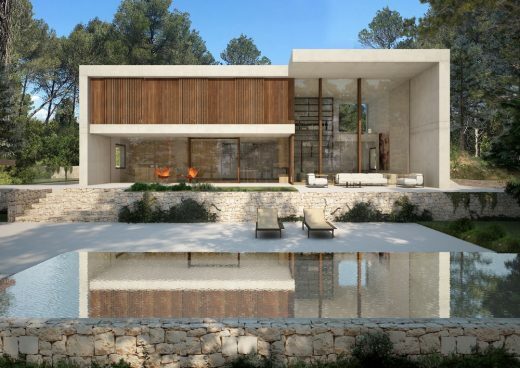 This simple Catalan property design references rocks as homage to the nearby mountains. The area of 790 sqm includes a basement, groundfloor & first floor. 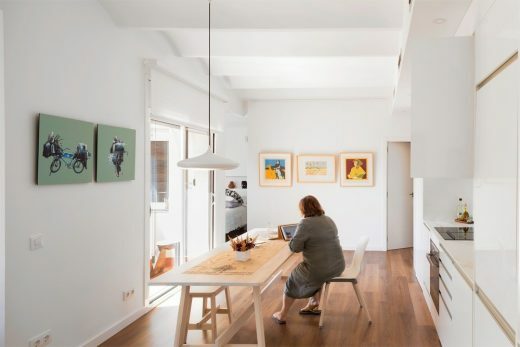 Located in a pleasant residential neighbourhood, the house is a compact building (almost a cube) surrounded by a 3 meters wide perimeter indispensable courtyard, which is the minimum mandatory gap based on current regulations. The pre-existing yard, the swimming-pool and the shed set at the back of the plot are preserved by express wish of the owners.